Paperless tickets: Is this the end of your ticket stub collection? 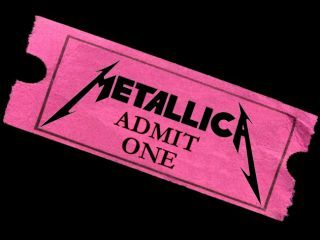 If you thought tickets for Metallica's Death Magnetic launch party at London's O2 Arena would be hard to come by, you were right. Because actually, they don't exist. Instead, ticketing heavyweights Ticketmaster will be using its latest innovation: the paperless ticket. The first artist to use the paperless technology is Tom Waits for his 13-date US tour this summer. Metallica's is the first gig in Europe to test the system, which, is supposed to save the environment, save time and save us all from greedy ticket touts. Fans purchase a ticket in the usual way by phone or online using a credit or debit card. Instead of receiving a ticket, customers need to arrive at the venue with said credit card and some identification - the card is swiped, they are given a receipt and hey presto, they get in. 1. In our experience, queuing to get into a venue can take long-enough without having to swipe a card and have your face inspected by a security guard. 2. This particular gig is for fan club and Mission: Metallica members only. "Hey mom, thanks for buying me these Metallica tickets, you're going to have to come with me and flash your ID so I can get in". 3. Call us old fashioned but, does anyone else like keeping the ticket stub as a memento?